2 adult & 1 junior 2nd kyu. We expect all of the above bar 2, to be attending Bournemouth or Liverpool national gradings this year. By December 2019 the goal apart from the above, is to have 5 or 6 more brown belt students. Next dojo grading likely to be MARCH 30th & 31st. TBC. I am very pleased to announce(late!!) that we have 2 students at 1st kyu which means that those two students will be the first for our club, hopefully at the end of this year, 2016. This is as hugh an acheivement for myself as well as for Vic and Laurel and we are all working hard towards it. I would like to extend my thanks to all parents, gauradians, friends and other family members for your support and trust over the years. many thanks to sensei neville Kinghorn for overseeing the test. 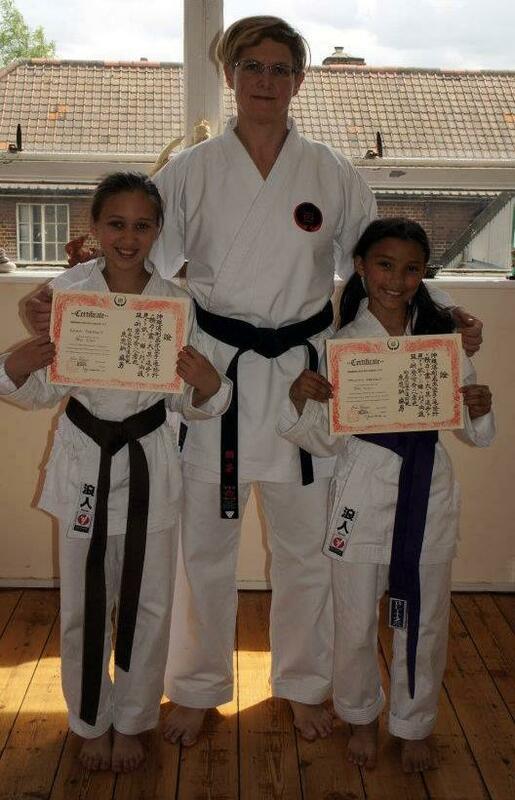 Congratulations to Kiera and Aaliyah who were assessed for their next grade by Sensei Linda at Tooting dojo today 17th June 2012. Aaliyah passed to 4th kyu Purple belt and Kiera to 3rd kyu Brown belt! Kiera is our and my, first, fully fledged brown belt as someone I have taught from a complete beginner. Kiera has clearly taken the ball and run off with it! 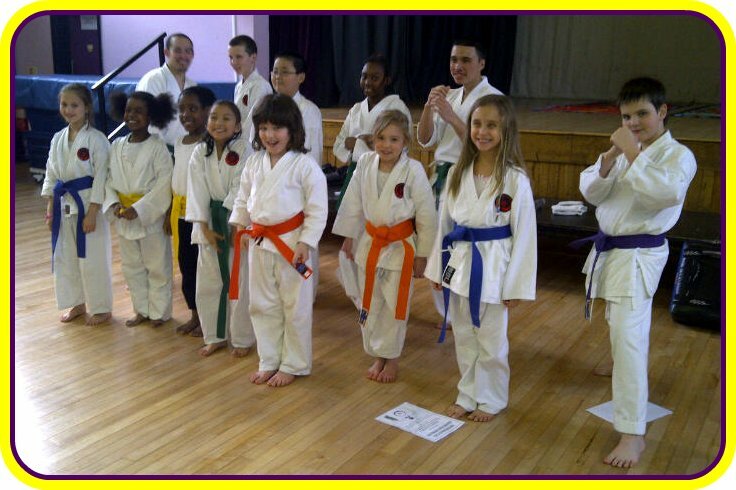 Aaliyah is hot on her heels though, as are the other purple belts in the club, Remy, Laurel, Hadleigh and Koray. I am very proud of you both and look forward to seeing you at the dojo. Many thanks also to Sensei Linda for passing you both today and also my thanks go to Sensei Ciara and Jasmine for pushing you to work hard. 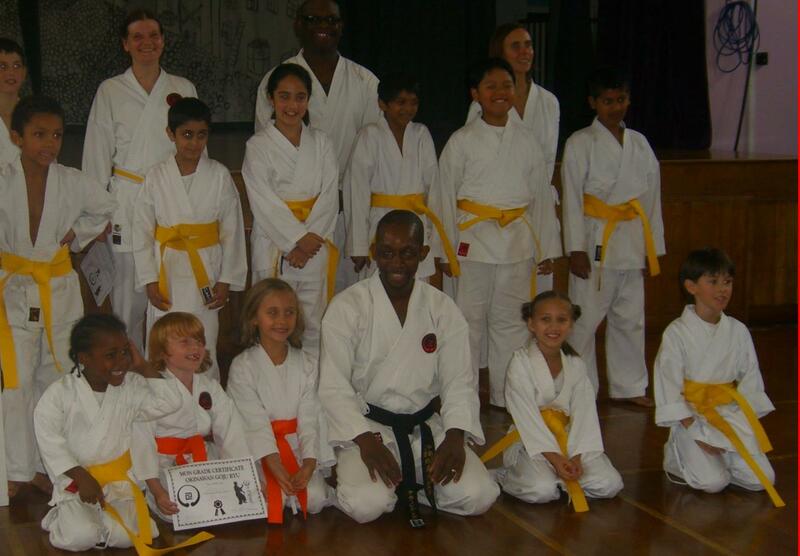 Next dojo grading for juniors on Sunday 22nd July at St Marys School dojo, Hornsey. Grading authority forms will be handed out over the next few weeks. From now on, adults will be tested seperately from junior students. This will allow the extra time needed to go through the necessary bunkai, kakie and kumite. 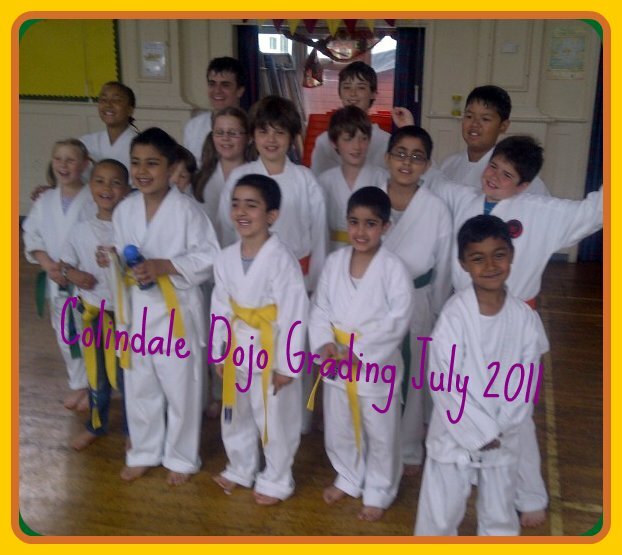 CONGRATULATIONS TO ALL STUDENTS WHO WERE ASSESSED AND PASSED THE SUMMER GRADINGS IN COLINDALE AND HORNSEY DOJOS!! WISHINGTON, OLIVER, ERIC, LAURIE & FINN FROM HORNSEY DOJO & A.S.C. A GREAT STANDARD OF KARATE AND A DETERMINED EFFORT WAS SHOWN BY ALL ON THE DAY AND I WAS VERY PROUD OF ALL STUDENTS! YUSUF, RONAN, SEAN G., SHARUJAN, ABDULLAH, MUSA, ADAM, AARON, BEN AND RUBY, WELL DONE!! THE NEXT ASSESSMENT IS TO BE CONFIRMED BUT MAY BE HELD AT THE END OF OCTOBER AND THE FINAL ONE DEFINITELY IN DECEMBER. A SMALL BUT TOUGH GRADING! WELL DONE TO YOU ALL! YOKU DEKIMASHITA! 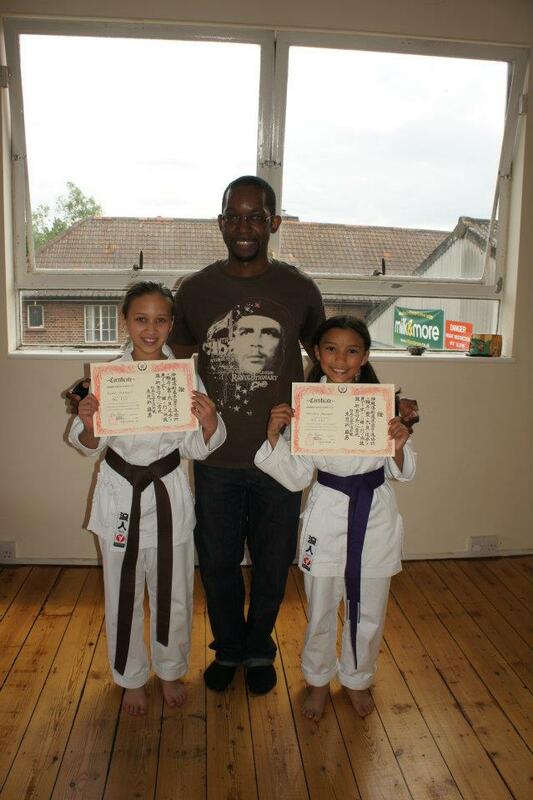 BLEND (COLINDALE DOJO), TEONE & OSHAUN (HORNSEY AFTER SCHOOL CLUB) ALL THREE OF THEM ALSO RECEIVED THEIR 1ST MON TAG! SHARUJAN (COLINDALE DOJO), NICOLE (COLINDALE A.S.C. ), ANDREW(HORNSEY A.S.C. 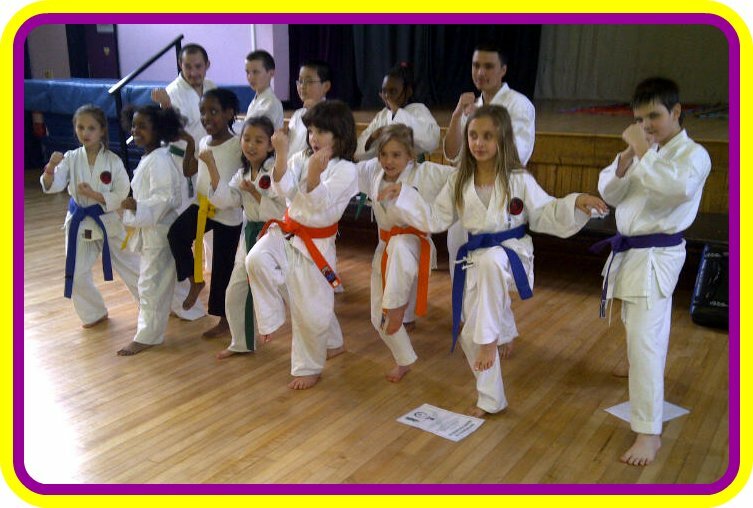 ), ELLIE & OSCAR (HORNSEY DOJO) THESE STUDENTS ALL EARNED THEIR 1ST MON TAG ALSO! ISAAK (COLINDALE DOJO), JOZAY (HORNSEY DOJO). AALIYAH FROM HORNSEY DOJO DOUBLE GRADED FROM 9TH KYU AND EARNED HER MON TAG! ISAAK ALSO DID VERY WELL TO EARN HIS 1ST MON TAG TOO! KANISH (COLINDALE DOJO) SECOND TIME AROUND FOR KANISH SO WELL DONE!! LAUREL FROM HORNSEY DOJO ALSO EARNED HER 6TH KYU 1ST MON ON SUNDAY! AFTER JOINING WITH DENTOH AND G.M.A.U.K. FROM ANOTHER KARATE STYLE AT BLUE BELT, KORAY FROM HORNSEY DOJO HAS WORKED HARD TO LEARN NEW TECHNIQUES AND KATA TO EARN HIS FIRST PROPER GOJU RYU GRADE OF 5TH KYU! YOKU DEKIMASHITA! AND KIERA, ALSO FROM HORNSEY DOJO HAS WORKED HARD SINCE DOING HER FIRST AFTER SCHOOL KARATE CLUB FOR JUST ONE TERM IN 2009 AND NOW TRAINS DILIGENTLY GOING FROM STRENGTH TO STRENGTH! FANTASTIC!! MANY THANKS AS ALWAYS TO PARENTS AND GUARDIANS FOR YOUR SUPPORT AND ENCOURAGEMENT AND THANKS ALSO TO MATT, MIKEY & HADLEIGH FOR HELPING OUT ON SUNDAY. MIKEY AND HADLEIGH BOTH EARNED MON TAGS FOR THEIR EFFORTS AT THE GRADING. VENETIA, CAMERON O AND BEN W. VENETIA & BEN ALSO EARNED THEIR 1ST MON TAG TODAY! WELL DONE! TYLER, ARCHIE C, DEJON, RASIAH AND NEVILLE. AYAAN, CAMERON T, BEN M, HAROLD AND JAHREL. CAM EARNED HIS 1ST MON TAG AND JAHREL DOUBLE GRADED FROM YELLOW TO GREEN BELT! EXCELLENT WORK! KORAY, AT 6TH KYU EARNED HIS 2ND MON TODAY WITH IMPROVED KATA AND RENZOKU BUNKAI - GOING WELL TOWARDS YOUR PURPLE BELT! THIS WAS OUR SPECIAL KARATE HALLOWEEN POSE!! AS WELL AS FULL GRADING, A NUMBER OF STUDENTS ALSO ACHEIVED THEIR 1ST MON TAG AND SOME OF THOSE WHO CAME ALONG TO TRAIN ALSO ACHIEVED THEIR MON TAGS SO WELL DONE! SEE YOU GUYS NEXT SATURDAY! GOOD LUCK TO THOSE GRADING TOMORROW AT ST MARYS' DOJO! 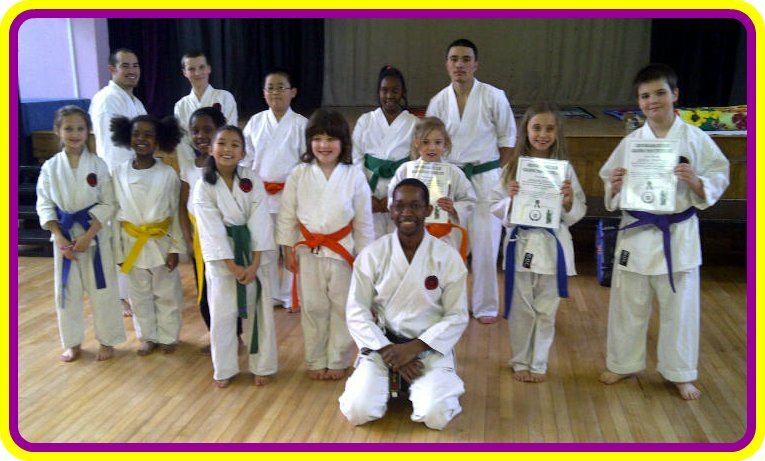 MIKEY & VICTORIA FROM ST MARY'S DOJO & JOSHIL FROM COLINDALE DOJO, YOKU DEKIMASHITA! KIERA FROM ST MARY'S DOJO, KHALISHA FROM COLINDALE DOJO & CHARLIE FROM HOXTON DOJO - HALF WAY TO YOUR BLACK BELT, YOKU DEKIMASHITA! REMEMBER THE LAST LINE OF THE DOJO KUN, "NEVER GIVE UP". FROM ST MARYS' AFTER SCHOOL CLUB ALSO, THIERRY, WHO DOUBLE-GRADED TO 8TH KYU FROM 10TH KYU WITH AN IMPRESSIVE PERFORMANCE OF GEKISAI DAI ICHI AND TRUE FIGHTING SPIRIT WHEN SPARRING WITH ME ON THE DAY, WELL DONE! 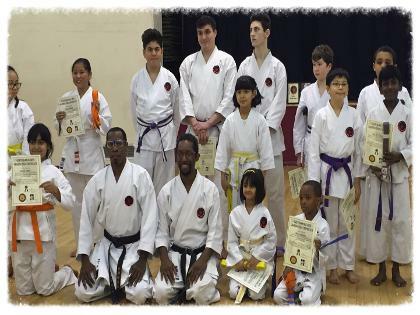 KORAY - HORNSEY DOJO, WELL DONE AND THANK YOU KORAY! YOKU DEKIMASHITA, ARIGATO GOZAIMASHITA!! THANK YOU ALSO TO MARJERIE FOR PROVIDING THE ABOVE PICTURES!! PLEASE ALSO SEND US YOUR PICTURES TO SHOW OFF ON OUR WEBSITES! WELL DONE TO ALL AND I LOOK FORWARD TO SEEING THE REST OF YOU AND 1 OR 2 FROM THIS GRADING, AT OUR NEXT ASSESSMENT ON MAY 21ST! Well done to all of you especially turning up even though the weather wasn't great! I also want to extend my thanks to Vic and Billy who helped to put some of the students through their paces! Looking forward to the next grading in March! As always, I want to say a huge thank you to all the parents, guardians and friends for your support and making sure they get to class each week and also for your support in cheering on Charlie at the grading! He most definitely made use of your cheers and gave me a run for my money! Well done Charlie and well done to all! Look forward to seeing you in your new belts this week.